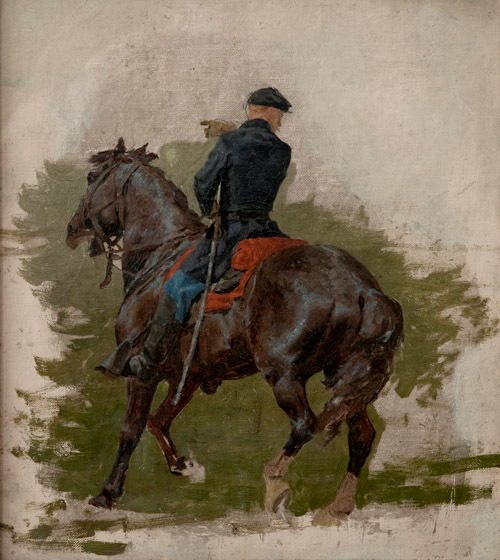 This small study, along with evidence of a study done for another one of the Army and Navy works, suggests that Trego’s usual approach of making individual studies for the major figures in his paintings was employed throughout the George Barrie commission. Though this was intended only as a sketch, a means to an end, Trego has obviously devoted significant time and effort to perfecting the rendering of the horse, a reflection of his lifelong love of horses. The artist dedicated considerable amounts of time and effort to the George Barrie paintings, even though they would never be publicly exhibited or reviewed in ways that would enhance his career. The study was obtained from the artist’s estate by Walter E. Baum and has been passed down in Baum’s family. It is now in the collection of one of Baum’s grandsons.